Drama-rama! What would a shoujo manga be without drama overload. Yet this isn't the same form of romantic melodrama that we see so often in manga. Instead, it's all about the high stakes audition for a role in Swan Lake. 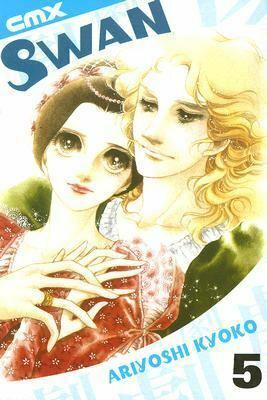 This volume is primarily about Hijiri battling it out with Sydney England, a British ballerina. Their relationship falls into a theme that is played over and over again in shoujo manga. The girl has an enemy (usually female). By the end of the volume, the enemy has become a friend, won over by the main character's selflessness and capability. In this case, Sydney comes to respect Hijiri's passion for ballet as well as the fact that Hijiri put herself on the line when Sydney sneaks out after hours. The plot of Swan Lake is a huge part of this volume. The story is told piece by piece spread out over most of the pages. Hijiri is dancing for a lead role in Swan Lake. She dances the White Swan and the Black Swan. While the drama is so overdone that it becomes a bit silly, I do like the fact that it is mostly conveyed through the drawings. Ariyoshi is able to draw movement and emotions in such a way that the reader feels a strong connection to the characters. Plus, a plethora of exclamation points just so we know that everything is important! I'm almost halfway through this series. I want to keep reading it to find out what happens, but the fascination is also petering out. It's becoming increasingly unrealistic with Hijiri's innate talent leading her to beat highly accomplished ballerinas despite that her technical training is lacking. But I'll keep going at least for now.